Herbal Products - Buyer Beware! Most commercially sold herbal products are of poor quality. Herbal preparations do not have the same high quality standards usually found in vitamin and mineral supplements. A recent health research study, which has been ignored by most alternative health sites, reported that consumer confidence in herbal products deserves to be very low. While quite a few alternative health sites love to knock big pharma's annual sales volume of 600+ billion dollars, none of them are dumping upon the small herbalism business, which has annual sales of 60+ billion. It is a dirty little secret in natural health circles that the herbalism business suffers every bit as much from the same profit motive, as does big pharma. 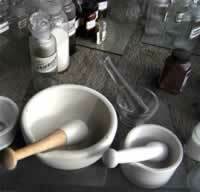 The Natural Health Perspective recommends against prolonged use of all medication, including herbal medicines. This open access research discusses a few of the problems that are innate to all herbal products. Herbs have a big problem. "Currently there are no standards for authentication of herbal products." In short, "there are ... no best practices in place for identifying the species of the various ingredients used in herbal products. This is because the diagnostic morphological features of the plants on which the current Linnaean taxonomic system is based [upon] cannot typically be assessed from powdered or otherwise processed biomaterials." The herbalism product business is wide open for abuse. Most of the testing done by these University of Guelph researchers looked only at 30 North American plant species in single ingredient herbal products, which were deemed by these researchers to be of poor quality including considerable product substitution, contamination, adulteration, and/or suffered from the use of fillers that were not disclosed on the food label. This quality control problem is happening precisely because there are no generally accepted standards for authentication of herbal products. Short of wildcrafting North American herbs and making your own herbal preparations; it is buyer beware. For example, when a customer buys Korean ginseng how do they know that they did not get American ginseng as a product substitution, or some entirely different herb? The answer is that they do not. Consumer fraud is widespread in the small herbalism products business. This recent study approached this authentication problem using DNA barcoding. DNA barcoding was developed at the University of Guelph, Guelph, Ontario, Canada. Previous research has indicated that even authenticating plants with DNA barcoding is anything, but straight forward. The DNA barcoding of plants is much more difficult than animal life forms. Which section of DNA coding should be tested for each herb is still in the process of being established. These researchers using the SRM herbal barcode library that was assembled from 100 different herbal species were able to establish authentication 91% of the time. Herbs innately suffer from a major quality control problem. "Most (59%) of the products tested contained DNA barcodes from plant species not listed on the labels. Although we were able to authenticate almost half (48%) of the products, one-third of these also contained contaminants and or fillers not listed on the label. Product substitution occurred in 30/44 of the products tested and only 2/12 companies had products without any substitution, contamination or fillers. Some of the contaminants we found pose serious health risks to consumers." "We detected product substitution within most (83%) of the 12 companies that we tested..."
"Contamination and substitution in herbal products present considerable health risks for consumers. In our study, we found contamination in several [herbal] products with plants that have known toxicity, side effects and/or negatively interact with other herbs, supplements, or medications. For example, we found that one product (HP8) labeled as St. Johnâ€™s wort (Hypericum perforatum) was substituted with Senna alexandrina (fabaceae); it contained only senna barcodes and no St. Johnâ€™s wort barcodes. This is a serious health risk as senna is a Food and Drug Administration (FDA)-approved nonprescription herbal laxative, which is not [recommended] for prolonged use as it can cause [serious] adverse effects such as chronic diarrhea, cathartic colon, liver damage, abdominal pain, epidermal breakdown and blistering..."
As an example, the researchers found contamination of one Ginkgo product with black walnut tree leaves. This article was originally published on 10/20/2013. DNA barcoding detects contamination and substitution in North American herbal products.